A-Fib is the newest condition that almost everyone is being diagnosed with as part of the early diagnosis, early treatment approach which is putting almost everyone on a pharmaceutical. This is the idea that has become the core of conventional medical treatment that prescriptions are now not for treatment, but for prevention. This is a fib. This makes you believe that a drug can prevent a heart event, when in fact it forces the heart to work in a way that it is not capable of doing well. This will over time create other problems and potentially a different kind of threatening event. So let’s think about the heart. The heart is electrical. It’s pace is electrical. Fibrillation is electrical. Any electrical field can disrupt another electrical field, with one big example being a lightning strike. The most dangerous aspect of a lightning strike on a person is the effect on the electrical system of the body including the heart and the brain. So even though wireless is much less intense than a lightning strike, it is having effects on us because of exposure over time. We provide here at Conscious Body Clinics a wonderful type of testing called Heart Sound Recorder Testing which has been around for many years. It helps us to “see” the rhythm of each of the heart valves and since we know what a perfect rhythm should look like, we can see when that rhythm is not perfect. The best part is we can provide essential nutrition for the heart and when we retest the difference is remarkable. We have even had someone have a test, then chew a B vitamin tablet, then test again and the improvement is just that fast! Clicking on the image will enlarge it for you. Look at this example. Here is a Heart Sound Recorder test done with a patient that was wearing an I-Watch and then we had them remove their I-Watch. The top two lines are two of the heart valves with the watch on and the bottom two are the same two heart valves without wearing the watch. What do you see? 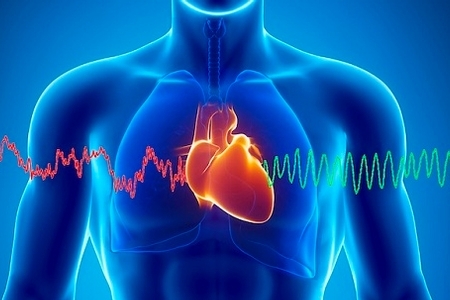 If you are suffering from A-Fib, could it possibly be a reaction to RF exposure? Could your wireless be affecting you? Many patients say that A-Fib strikes them even when they are resting…. do you leave your wireless on all the time? Do you use a laptop, I-Pad, I-Phone in bed or do you wear your I-Watch to sleep at night so it can monitor your sleep? How do you think it does that exactly? There is no way to say that these electrical fields are not affecting us. And if A-Fib is something you are dealing with, then don’t you want to consider every possibility? Try a test for yourself. The week before you go your conventional physician for your next heart test, stop all your wireless and computer use as much as you can. Don’t wear an I-Watch, don’t have any screen use or electrical devices in your bedroom, shut off your cable and wireless and even unplug it from the wall. Then go in and see how it looks. You may be in for a big surprise!